So anyway, the whole hoop-jumping circus the oculus runtime tries to set up on ms-winblows for “direct access” to the rift, using grotesque custom monitor and display drivers, is really easy to do under X; it’s built into the system since its inception, and it’s called a “Screen”. One or more “Screen” sections, binding together a Device and a Monitor by referencing the appropriate section identifiers, to describe available color depths and resolutions for each combination. 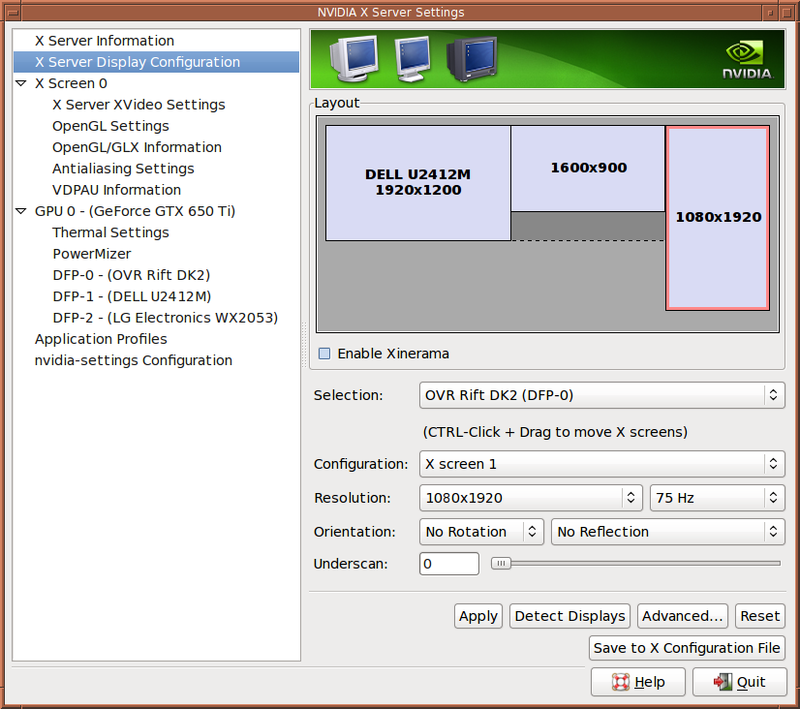 Once set up this way, the configuration couldn’t change without restarting the X server, and each screen would be completely separate; the mouse cursor would move between screens (according to the spatial layout specified in the ServerLayout), but windows belonged to a specific screen, and couldn’t move between them. Rigid, but simple and extremely clear. Nowadays of course, most multi-monitor setups use the XR&R (xrandr) extension to add and remove “outputs” on a single X screen dynamically, or the equivalent nvidia proprietary counterpart called TwinView. This approach extends a single desktop area across multiple monitors, which is awesome for regular monitors, but really horrible when it comes to peculiar devices such as the rift. BoardName "GeForce GTX 650 Ti"
Of course if you use the proprietary nvidia drivers, you may also run nvidia-settings, configure your screens from the GUI, and press a button to create the xorg.conf file automatically (which will take effect when you restart your X server). Note that under “configuration” for the currently selected rift screen, it says “X screen 1”. Initially this combo box will have “X screen 0” selected; you need to click on it and select “New X screen” to create a separate screen for the rift. If the rift is set up as a separate X screen, you don’t have to fiddle with moving windows around to place them at the right position of the desktop to show up in the rift, and pray to odin that they stay there when you switch to fullscreen. Just instruct the program to use the correct screen by setting the DISPLAY environment variable, and it can’t escape if its life depended on it (well it could ignore the DISPLAY env var and open a window elsewhere, but that takes conscious effort to do). The first number just after the colon is the display (X server) we wish to run the program on, followed by the screen number after the dot (our main monitor would be :0.0, or just :0). I rotated the vnc output by 90 degrees because the rift has a portrait display and all VR apps are sideways to compensate. I also scaled it by 50%, and instructed the vnc server to shut down when the viewer disconnects. Feel free to use it, I found it very handy.